It was a gorgeous Easter weekend. Almost 20˚C, sunny, spectacular. Vancouver at its best. We had the house full of family, so it was busy, and when we went outside, we were pitch-and-putting, or walking along the ocean. I didn’t get to sit down to draw. But at least I got around to drawing two of my family members. 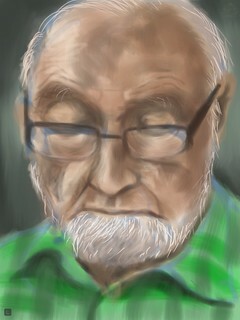 Painted on the iPad with Procreate, from life, not photos. It took about 40 minutes per painting. It was good practice. And the models were free.